Plein air painting at Okoboji! I will be teaching a 3-day plein air workshop sponsored by the Pearson Lakes Art Center in Okoboji, Iowa at the end of June. Push the button below to get more details and sign up! On November 9, I received the "Best in Show" award at the Greater Des Moines Exhibited 21 at the Heritage Gallery. 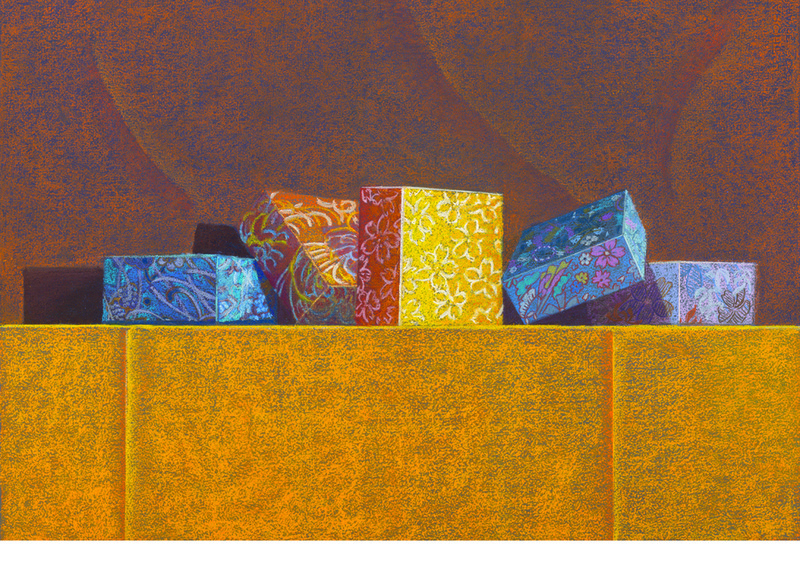 Mark Marturelo, an illustrator for the Des Moines Register and juror for this show, commented: "Pamela has some exceptional pastel works on display. The "gift boxes" was a piece that I had to go back to over and over again. A great command of the medium and this particular piece had a very simple yet sophisticated design. The colors chosen worked well off of one another. This is just a great overall piece--it must be because I'm not a big fan of pastel. She has made me a believer." This show represents many talented artists from the greater Des Moines area. It is worth a trip downtown to check it out. The Heritage Gallery is located at 111 Court Ave, Des Moines. Hours: 11 a.m. to 4:30 p.m. Monday-Friday. Admission-FREE. Effective October 13, I am now affiliated with Outside the Lines Art Gallery in Galena, Illinois. If you are in the Galena area be sure to visit the gallery. There is a lot of wonderful 2D and 3D artwork from artists all over the midwest region. Connie is very helpful and can tell you about each of the artists represented in the gallery. Fall classes will begin again the week of September 9. Students meet for three-hour classes weekly for seven weeks on Tuesdays (1-4) or Thursdays (9-12) or Thursdays (1-4). Two of my pastel pieces were juried into the Iowa State Fair this year (August 7-17). Be sure to visit the Cultural Building while you are at he Fair. The fine arts exhibit has been moved to the 3rd floor of the Cultural Building. If you are trying to find a cool place to hang out at the fair, this building is now air conditioned. There is also an elevator if you don't want to climb the stairs to see the show. Enjoy! I spent a little over a week in the Burgundy region in late June doing "en plein air" painting with 21 other artists from all over the world. Our instructor for the trip was Costa Vavagiakis from the New York Students' League. Its always great to make new friends, eat wonderful food, drink excellent wine, learn new things, and paint outside everyday, all day long. I highly recommend it!!! I also visited a lot of museums while on this trip. The Van Gogh museum in Amsterdam was the highlight of the museum tours. I felt this was the most engaging museum I've been in in a long time. The museum is set up to lead you through Van Gogh's art experiences over the ten years that he painted. There are a lot of examples of paintings by the artists that influenced him and scientific studies about his work. The audio tour, which is included in the ticket price, adds important bits and pieces that make the tour extraordinary. To see what I worked on this winter, go to the Ankeny Art Center. You may want to viist their website to see when they are open before you plan your visit. They are located east of the John Deere plant in Ankeny. The show ends on July 30, 2014.